Human Resource Management has evolved to become a core asset of every business in managing people and the workplace culture, and when implemented effectively, can contribute greatly to the overall direction of the business and the accomplishment of its goals and objectives. Moreover, today, the permeation of technology into this domain has allowed for massive strides to be made in terms of redefining HR processes and providing them a more strategic role within organizations. Corroborating this fact are research reports which forecast the Global Core HR Software market to grow at a CAGR of 8.8 percent and reach a total of USD 9.89 billion by 2022. Enterprises are thus increasingly leveraging Human Resources Management software to attain cost control, scalability, improved employee training, quicker return on investment and other such benefits that lead to better decision making and a positive incline in productivity. However, despite the many advantages of this software, the path to HRMS implementation isn’t always a smooth one with many organizations encountering challenges with respect to change management, data migration, system testing, budget constraints and end-user training. Perfectly understanding these different challenges, Chennai headquartered Zoho Corporation steps forward to address them with an inclusive suite of HR Software services to help organizations automate their Human Resources operations and boost their overall productivity. "Through automating processes across business, network and IT infrastructure management, we allow our customers to better focus on their core business"
Zoho is THE operating system for business - a single cloud plat form with all the necessary applications to run a business entirely from the cloud. Businesses can acquire and manage customers using Zoho's marketing, sales and customer support applications - Campaigns, CRM and Desk and can then empower employees to create, store and distribute content on the cloud with Zoho's productivity and collaboration applications Office, Mail, and Docs. Additionally, businesses can run their own operations on Zoho's finance and human resources applications Books, People and Recruit. More than 20 million users around the world across hundreds of thousands of companiesrely on Zoho every day to run their businesses including Zoho itself. A business can choose to run the entire Zoho suite or just a single application. Zoho applications are available directly through zoho.com, or through an ecosystem of hundreds of world - wide Zoho partners. Zoho is a division of Zoho Corp. a privately-held and consistently profitable company, with more than 4,000 employees. Zoho is headquartered in Pleasanton, CA with international headquarters in Chennai, India, and offices in Austin, Lon don, Yokohama, and Beijing. With a prominent global presence spanning across countries such as the US, UK, France, China, Germany, Spain, Australia, Singapore and India and over 30 million users worldwide, Zoho provides over 40+ smart software products to aid organizations across the departments of Sales & Marketing, Email & Collaboration, Finance, Business Processes and Human Resources, including an office tools suite, IoT management platform, and a suite of IT management software. “Zoho’s solutions have been tailored with an immense capacity for customization to fit the unique business requirements of every organization. Through auto- mating processes across business, network and IT infrastructure management, we allow our customers to better focus on their core business,” affirms Sridhar Vembu. 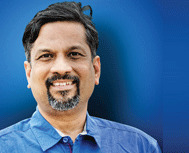 Founder & CEO, Zoho Corporation. Zoho’s expansive portfolio of offerings includes solutions for Sales & Marketing, Email & Collaboration, CRM, Network Management, Enterprise IT Management, Social Media Management, Invoicing, Accounting, Finance, Email Marketing and HR Management. When it comes to managing Human Resources, Zoho's HR software suite has been designed to boost efficiency, manage diverse business challenges and automate routine tasks for its customers. Commenting on today's market scenario, Sridhar elaborates, “With both small and medium enterprises expanding at a rapid pace, it has now become mandatory for companies to adapt to the newest technologies and look for the right talent as one organization’s loss quickly becomes another organization’s gain,” Moreover, with most solutions in the market being focused on one particular need of HR such as leave and attendance, time tracking or performance, the need of the day is an all-in-one solution where all HR functions are interconnected. Acknowledging these needs of the industry, Zoho’s HR suite addresses them through allowing enterprises to view and manage all their HR activities in a central place, thereby equipping them with better visibility and communication. Management, Zoho has developed its comprehensive Human Resources Management system Zoho People, to help organizations manage all employee related actions on a single platform. Be it for the fundamental requirements of a start-up or advanced enterprise level requirements, Zoho People has been crafted to cater to the unique demands of businesses of all sizes across different industries. The platform’s core HR management modules thus include all administrative actions from employee on boarding, attendance management, leave and time tracking to document management, database management, performance evaluations and analytics. With capabilities to manage all HR administrative actions from a central location, Zoho People not only equips administrators with automated workflows, centralized employee data and easy tracking of time and attendance but also provides employees with self-service features to update their personal data and skill sets. Along with these features, Zoho People also allows for several integrations with third party applications and is armed with advanced analytics to enable HR staff and employees to be more efficient and productive in their operations. Moreover, recognizing that one of the most vital qualities of a solution is its capacity for customization, the company has made the platform highly customizable, to make it easy for organizations to set up an HRMS in alignment with their business processes and culture. Zoho People also ensures a high level of security for all data that is collected and processed with an access control system based on employee roles, in which permissions can be set for every data field to ensure the safety of sensitive data. Options to encrypt data fields and to mark a field as “personal” ensure utmost security and more control over the data that is being processed. Over the years, the challenges faced by HR departments in one of their key tasks - employee recruitment; has increased with the heavy competition, lack of resources and finding employees who fit the organizational culture. Zoho responds to these challenges with its Applicant Tracking System, Zoho Recruit, designed to cater to the multiple hurdles faced by recruiters today. As a complete solution for both in-house recruiters and staffing agencies, Zoho Recruit is equipped with several easy resume extraction tools, workflow automation, advanced analytics and integrations with several third-party applications to streamline the entire recruitment process and offer a great candidate experience. Right from sourcing and screening the candidates to obtaining the client's approval, and eventually hiring people, sending offer letters, invoicing the client or updating the candidate, Zoho Recruit manages the entire recruitment process and is also highly customizable to allow its users the freedom to finetune the software for their specific business requirements. Some of the unique features of this software include customizable modules with respect to the departments and hierarchy of a company, the "forward - to - hiring manager" feature to send candidate profiles to the hiring manager for review, the submit-to-client feature to send candidate profiles for easy collaboration with clients, as well as capabilities to set data access limits and additional levels of security. “Having identified important aspects such as redundancy in filling out repetitive data and delay in communication between two parties which hinder an employer's ability to hire the best candidates, Zoho takes the utmost care to address these issues when matching potential candidates to the employer,” states Sridhar. Zoho Recruit also provides an array of candidate sourcing mechanisms, making it easy for recruiters to reach the best talent within a short span of time. Having operated in business across verticals for over two decades, Zoho Corporation has grown to be a distinguished technology solutions provider in this segment with an esteemed clientele across the globe. Leveraging this position, the company hopes to further enhance its HR solution suite through building state-of-the-art features around Zoho People and Zoho Recruit, to augment their subscriber base. Further, along with plans for expansion, Zoho also envisions developing new products to revolutionize the HR software industry in the coming years. “The focus has always been on acquiring the right candidate for a particular job in a minimum amount of time. Zoho will continue to build advanced capabilities around HR functions to meet the needs of this domain,” concludes Sridhar. CRM strategies today, while providing an effective way to increase customer retention and generate better revenues, aren’t without challenges and present organizations with concerns of costs, training, integration of CRM with other business management solutions and selecting the right solution providers. Zoho CRM is Zoho’s answer to businesses that grapple with these concerns. As a web-based CRM designed to attract, retain and satisfy customers to enhance business revenues, the core of Zoho’s CRM functionality is lead and contact management along with sales pipeline management and purchase control. With capabilities to automate everyday business activities, track sales, and engage customers on different platforms, Zoho CRM plays a crucial role in matching leads with the appropriate sales agents and converting them into buyers in real-time. The platform also offers an Opportunity Tracking tool, allowing its users to identify and target inactive leads with historical data to realign their customer messaging. As a testament to its many capabilities, Zoho CRM has received a number of awards over the years including the 2012 ‘CRM Magazine Market Leader’ Award and the 2012 Sleeter 'Awesome Application' Award.